Through these characteristic features of the subtract has an easy to clean effect. In addition, the coating has excellent antibacterial properties as a deposit. Suitable for : Concrete, Floor Sealing, Lime sand brick, Clinker brick, Sand brick, Travertine, Granite, Mineral plaster with less than 5% organic binding material content, Natural stone, Brick, Unglazed tiles, Glass, Carpet, Paper, Textiles, Solar panel, Electronic parts, Protect equipment, Wood furniture from rain and moisture of any kind. Photocatalyst Anti-wet can be on Etoh based for faster dried and water based for normal dried. It creates a thin hydro and oleophobic layer on the surface which prevents the sticking of lime scale and impurities and increases the repellant of water; Through this the surface is much easier to clean. 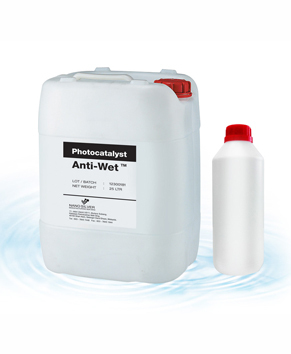 Photocatalyst Anti-wet can be dilute up to 10 to 20 times with Water or Etoh. Per liter of Photocatalysy Anti-wet are very economical to use (80 – 100/m2 depending on application method and surfaces). Photocatalyst Anti-wet (super hydrophobic) coating actively shrugs of water, grease and would be stain. Shaking it off multi layers of photocatalyst Anti-wet can be used as a coating for cotton fabric and carpet that would actively ward off liquid and stain. The material is stabilized by exposure to UV light. Photocatalyst Anti-wet nano coating could make future clothes more than just stain-resistant; they’ll be stain offensive actively soughing off dirt and gunk to protect the fabric underneath. Instead of merely repelling water or grease, clothing will push them away. This method can work with almost any organic substrate such as wool, coconut hush or hemp clothing which could be waterproofed too. The result is a super hydrophobic coating that successfully with stood assault from acid base soap and solvents and lasted through 50 times washing machine cycles. Photocatalyst Anti-wet coating makes paper, waterproof and anti bacterial. A photocatalyst Anti-wet spray can turn regular paper into super paper, rendering it waterproof, antimicrobial, magnetic and probably very expensive. Who said paper was an old technology? Photocatalys Anti wet developed a process to cover any cellulose fiber, like paper or fabric with a reactive coating. It involves combining the fiber molecules with a photocatalyst anti-wet solution, creating a polymer matrix. The cellulose fiber are wetted with photocatalyst anti wet form a nano-shell around each individual fiber rendering the fiber water repellent. Add some colloidal silver and it could be antibacterial Aside from the small nano – shell around each of the fibers, the paper’s properties don’t change – you still can print with it. Fold it, mail it or whatever you want. The paper could have a wide range of applicants, from food packing and medical documents to secure bank notes waterproof paper could be used to protect valueable documents. Electronic parts and protect equipment from rain and moisture of any kind. -Reliable protection against corrosion-highly resistant, even under water and dissolves rust. Sealer with antibacterial properties for room, Bathrooms or kitchens. – Antibacterial –Easy to clean, Dirt resistant reduce moss and algae. For glass surfaces particularly suitable for use in bathrooms or interior car windows. -Trained film is transparent – anti-fog film is formed increased safety through better vision. The above product is confirming our specifications when supplied in original container. The information above relates to the specified batch number and delivery. This date does not release the customer from checking the quality of this product immediately after acceptance. This certificate has been electronically generated and therefore is unsigned. 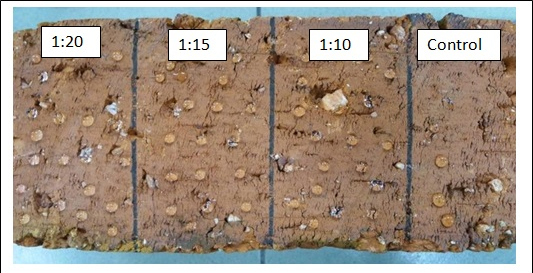 To study the water resistant performance of Photocatalyst Anti-Wet on brick stone. This experiment was contacted based on the hydrophobicity of a surface that related to its contact angle. 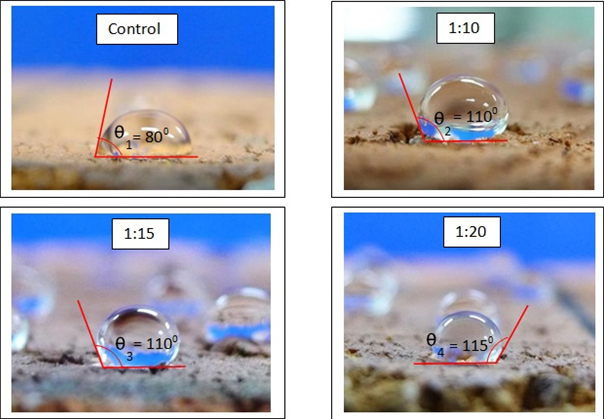 The higher the contacts angle the higher the hydrophobicity of a surface. Surfaces with a contact angle < 90° are referred to as hydrophilic and those with an angle >90° as hydrophobic. AntiWet was diluted according to ratio 1:10, 1:15 and 1:20 with water. 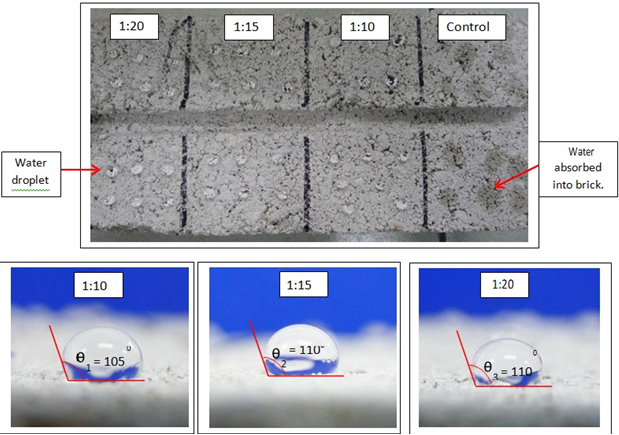 The images of water droplet on top of the brick surface were recorded.